Axumite. King Wazena. ca. AD 520's. AE unit with gold iinlay. Date : The dates of the Axumite kings are now well understood, but King Wazena was probably ca. AD 520's, although Mitchiner places him nearly 150 years later than that. Reference : Mitchiner Ancient #423 to 427. MH 120. Size : 15.8 x 16.2 mm. Weight : 1.45 grams. Grade : VF/F but some areas still encrusted and might be improved with carefull cleaning. Obverse : King's but right holding a branch, with and inscription that translates to "TO PEOPLE TO WHOM IT PLEASES". 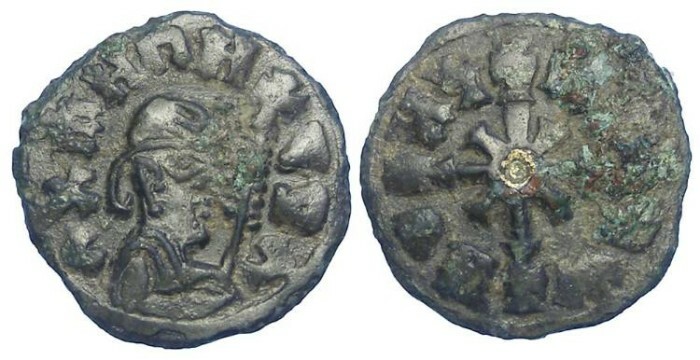 Reverse : Cross on cross with small gold inlay in the middle, with and inscriptions that translates to "of Wazena, Negus". When this coin came to me it was much more encrusted and the gold inlay was not visible. What cleaning has been done, including exposing the gold inlay, was done by me, but more could be done if someone were skilled and very patent.